Battle Rope Exercises are some of the most high intensity drills you can find, and here are 24 variations of them! During this video, you’ll find multiple variations using single rope waves, double rope waves, and the little-used (but insanely beneficial) rope pull variations. 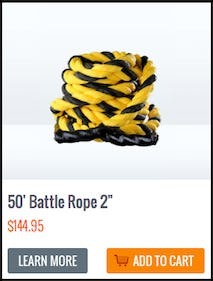 There are a multitude of Battle Rope Exercises that can be performed using a single length of rope and a wave movement. Unlike exercises using two ropes, you will be able to perform more repetitions (since their is less weight) at a higher intensity. If you’re new to Battle Rope Training, this is an excellent way to progress up to more difficult double rope variations. Double rope Battle Rope Exercises are the most commonly used and seen in most unconventional facilities. Just like the single rope variations, double ropes have a multitude of exercises that can be performed. Using both hands on separate ropes makes each drill more difficult as each rope can move in different planes of motion. Separate ropes will also be heavier, requiring more strength, power, and conditioning, especially in relation to your grip, arms, and core. 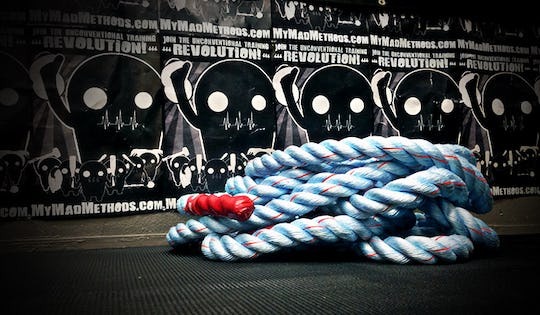 Battle Rope Pull Exercises are probably the most underutilized of all Battle Rope variations. Unlike your standard undulating wave exercises, rope pulls hit your body in an entirely different way. As the name implies, pull drills requiring every muscle associated with any pull exercise (examples of pull exercises include Pull Ups, Rows, and Deadlifts), giving you amazing back, grip, and arm strength.